Bengaluru: Convinced that the May 12 election cannot be won with the strategies formulated by the State BJP leadership, party National President and master strategist Amit Shah has entrusted the responsibility of poll management to his trusted lieutenants from North India who have tasted success in other States including Uttar Pradesh and Bihar. Shah’s focus is on strengthening the party’s election booth management and this strategy is seen as a big factor in the party’s serial election victories. As part of booth management, party workers are assigned to mobilise more voters to vote for the party at the booth level, with a special focus on booths at which the party has fared poorly in the past. The BJP President has inducted a team of party functionaries from across the country — a team of election managers he trusts, led by Ram Madhav, National General Secretary, and Bhupendra Yadav — to run the party’s crucial campaign. The State has been divided into seven regions and 11 members have been made in charge of them. Ram Madhav, who has been credited with successful election management in Jammu and Kashmir and in the northeast, has been made in charge of Hyderabad Karnataka (40 seats), considered to be a weak link for the party. Yadav and Om Prakash Mathur, both close aides of Shah, have been made in charge of Mumbai Karnataka (50 seats), a region where the BJP has to win big to cross the halfway mark, and coastal Karnataka (37 seats), where the party lost in 2013. Others on the team are Satish Upadhyaya who will look into South Karnataka and old Mysuru region, former Delhi BJP President and Ashish Shelar, former Mumbai unit BJP President. 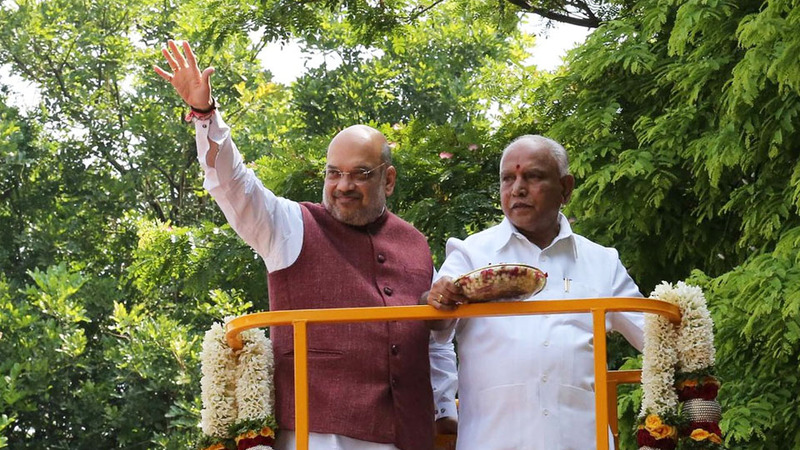 Party sources said that a centrally driven micro-managed campaign has been Shah’s style and Karnataka is no different. All the 11 election managers arrived in Bengaluru on Tuesday night and were part of strategy meets held in Bengaluru yesterday. They will camp in their respective regions till the elections. Commencing the process of reviewing the micromanagement of poll strategy, Shah held meetings with ‘Shakthi Kendra Pramukhs’ and regional in-charges. Shah firmly believes that the BJP’s success in forming governments in 20 States goes to booth workers and ‘Shakthi Kendra Pramukhs’, and hopes to recreate that strategy in Karnataka. Yesterday morning, Shah addressed a convention of Pramukhs of Bengaluru (each in-charge of five polling booths), exhorting them to work towards ensuring party victory in all 28 constituencies in the State capital. Making a personal appeal to the Pramukhs, Shah said that he and Prime Minister Narendra Modi came up in a hard way and the party needs to win Karnataka in order to extend its influence over the Southern States. “While Modi sold tea on Railway platforms in his childhood, I grew up pasting posters of political parties. Today I am the President of BJP and I began to work for the party at booth levels,” he said. Chief among his directions to the Pramukhs and the booth managers are for every five booths, there should be one ‘Shakti Kendra’. Each ‘Shakti Kendra’ is a collection of five polling booths that assess the party’s strengths and weaknesses on the ground. “Study previous election results at booth level, hold booth strengthening drives, and have at least ten people from SC, ST community in every booth level committee,” he said. “At every booth level, there should be five wall paintings saying “Ee baari BJP Sarkara” (This time it will be BJP government) and every booth level committee President should hoist BJP flag at home,” he said. Shah asked them to implement BJP’s ‘Panna Pramukh’ strategy where each worker is given responsibility for a ‘Panna’ or a page in the electoral rolls. Each page in the voters’ list has the names of eight to twelve families. Bengaluru: Into a full-time battle-ready mood for the May 12 polls in Karnataka, BJP President Amit Shah has moved into a private rented house at city’s Fairfield Layout area that is near the Race Course Road. The residence will also work as an interim war room wherein the BJP chief will monitor and micro-manage all political developments in the State. According to a BJP leader, alternative arrangements have to be made as Shah cannot stay for long in a Government Guest House or hotel for longer stay in view of election code of conduct. The party’s State unit is likely to pay for the rent, sources said.